Dairy cows reached £2,600 from a Lurgan farmer and same owner received £2,200 and an Armagh farmer received £1,900 for a freshly calved heifer. An entry of 140 cull cows returned a further improved demand particularly beef-bred cows which sold steadily from £135 to £168 for 736k at £1,236. Fleshed Friesians from £97 to £115 for 868k at £995. Second quality Friesians from £80 to £95 per 100 kilos. Poorest types from £60 to £75 per 100 kilos. Richhill farmer 736k, £1,235, £168; Mowhan farmer 746k, £1,145, £154.00; Annalong farmer 640k, £975, £152.00; Banbridge farmer 658k, £995, £151.00; Lisburn farmer 792k, £1,195, £151.00; Pomeroy farmer 662k, £975, £147.00; Belleeks farmer 704k, £1,035, £147.00; Augher farmer 746k, £1,095, £147.00; Collone farmer 728k, £1,055, £145.00 and Lisburn farmer 750k, £1,075, £143.00. Newtownhamilton farmer 648k, £995, £115.00; Pomeroy farmer 752k, £835, £111.00; Dungannon farmer 662k, £715, £108.00; Dungannon farmer 656k, £695, £101.00; Hamiltonsbawn farmer 706k, £695, £98.00; Dromore farmer 682k, £665, £98.00; Markethill farmer 672k, £655, £97.00 and Killylea farmer 746k, £725, £97.00. 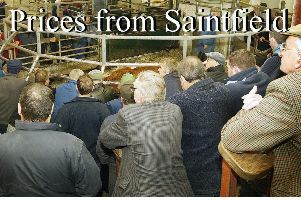 The 130 calves sold in an excellent demand. Good quality bulls from £260 to £380 each with a top of £415. Good quality heifer calves from £220 to £300 with a top of £400. Belgian Blue £415; Charolais £365; Belgian Blue £380; Charolais £340; Simmental £330; Hereford £320; Simmental £290; Aberdeen Angus £285 and Simmental £270. Charolais £300; Belgian Blue £300; Belgian Blue £295; Belgian Blue £290; Limousin £275; Simmental £270; Belgian Blue £270; Belgian Blue £245; Aberdeen Angus £245 and Simmental £235.